Leprosy in the 21st Century? The World Health Organization’s claim in 2000 that leprosy had been eradicated worldwide caused a widespread disservice to leprosy patients. This was reflected in the diminished giving to agencies devoted to both research to cure the disease as well as the ongoing care of affected families. In order to have a frame of reference for this premature and misleading announcement, one must understand WHO’s definition of “eradication,” which is less than one case per 10,000 individuals in a country. In countries with close to a billion and a half human beings, like India or China, those numbers are still staggering, as is the care for those with long-term disabilities from the disease. Even among those whose infection has been arrested with medicine, victims must continue to live without fingers, toes or whatever the disease has already claimed from their bodies prior to their treatments. Most live difficult, lonely lives, forced to live in isolated, forgotten communities. We have not forgotten them, however, because we know that Jesus has not. And we’re doing everything we can to improve their lives, encourage those who trust in the Lord, and bring the love of God to those who don’t yet know Him. 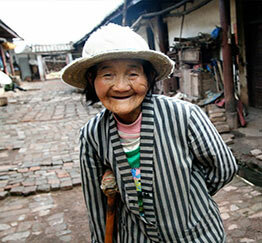 The dreaded disease of leprosy still destroys bodies in many areas of the world. We are reaching out to these isolated communities with Christ’s compassion. 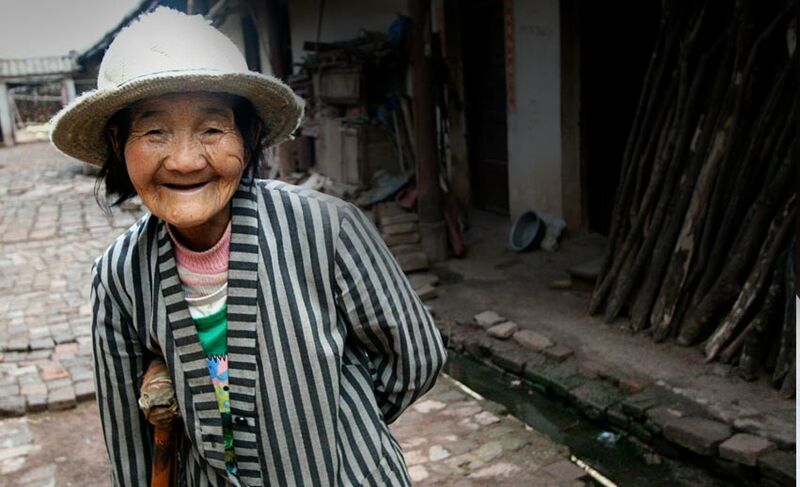 Due to their huge populations, both India and China are facing the greatest challenges to addressing the problems facing leprosy-affected families. Many Third World countries are facing similar struggles, just on a smaller scale. While only 5% of the world is susceptible to the airborne bacteria that causes leprosy, the challenges of poverty, overcrowding, poor hygiene conditions and limited access to health services prevent its eradication in poorer countries. 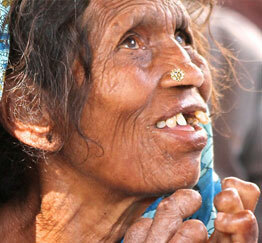 If left untreated, leprosy attacks nerve endings and destroys the body’s ability to feel pain. 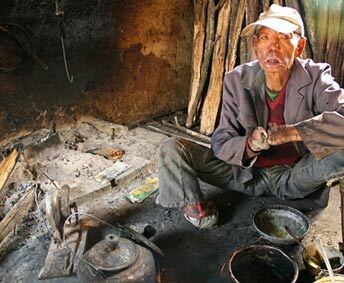 As a result, those afflicted with leprosy unwittingly injure themselves with burns and cuts, and suffer infections that result in tissue loss. Fingers and toes are often the first body parts to suffer. 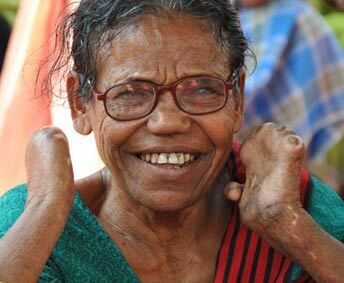 Many of the individuals that we serve in India, China, Nepal and Kenya received the Multi-Drug Therapy (MDT) too late to stop the disfiguring degeneration that marks a leprosy patient. Cultural stigmas and fear have forced them to leave their homes, rejected by their communities and, many times, by their own families. Too often they are forced to beg for “alms” to survive, and their children – most of whom have not been affected by the disease – find it difficult to attend public schools, partly due to their families being ostracized, and also because of their lack of finances. Pictured above: a man in a Chinese leprosy colony whose hands have been eaten away by the dreaded disease, and a young girl whose parents are victims of leprosy holding her new books that we helped provide her with. Helped a leprosy-affected person open a store to provide daily goods for families of the Moula-ali neighborhood in Hyderabad, India. 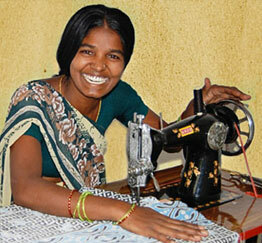 Pooja’s parents are leprosy victims, Pooja doesn’t have leprosy but she lives with the rejection and poverty. Your gift will help to provide holistic, Christ-centered ministry to leprosy-affected persons who have been ostracized by society.